Myxomatosis is a devastating viral condition affecting rabbits everywhere. As a responsible rabbit owner, it is important that you know the signs and symptoms for recognising infection and treating it immediately. While the chances of survival in affected rabbits used to be nil, widespread immunity has meant that survival rates are up slightly, with roughly 35% of infected rabbits now recovering with intensive care. What is Myxomatosis and how is it spread? The Myxomatosis virus was first discovered in the late 19th century in Uruguay. From here it was deliberately imported to Australia in a drastic bid to reduce the country’s large population of rabbits. It worked; Australia's wild rabbit population dropped from 600 million to 100 million in just two years. From Australia the virus was introduced to France and subsequently spread throughout Europe. Myxomatosis has since posed one of the biggest threats to both wild and domestic rabbits and continues to cut short the lives of rabbits across the globe. Put simply, Myxomatosis (or ‘myxy,’ as it is sometimes shortened to) is a pox-like virus that is easily transmitted between rabbits. Biting insects such as fleas (typically the rabbit flea Spilopsyllus cuniculi) and mosquitoes can spread the virus from host to host, whatever the time of year. The virus has the ability to survive and lay dormant inside parasites through winter, returning to fruition as the weather improves again. Because of this, taking measures to protect your rabbits year-round is a top priority. The virus can also be spread directly from rabbit to rabbit, and indirectly through contaminated food bowls, drinkers and bedding etc. As soon as primary infection is suspected, the affected animal should be isolated and the entirety of its housing and items should be disposed of immediately. If your clothes have come into contact with an infected rabbit through handling, these should be washed or disposed of before you handle again. Unaffected rabbits should be moved onto new grazing following an outbreak and any remaining food on the ground should be cleared up promptly. Recognising Myxomatosis is relatively easy and most people will at some point have witnessed a wild rabbit riddled with Myxomatosis, sitting blind and matted at the roadside. Unfortunately, it is not an uncommon sight. The incubation period is the time between contracting the virus and first exhibiting symtoms and for Myxomatosis this period is anything upto 2 weeks. Once symptoms appear, the infected rabbit deteriorates rapidly and usually does not survive beyond the 14 day period. Symptoms will vary depending on the strain of the virus and the breed of rabbit infected. Before visible signs are observed, an infected rabbit is likely to lose its appetite and become uncharacteristically lethargic and disinterested. The sign we most commonly recognise as being symptomatic of Myxy is conjunctivitis - swollen, red and runny eyes. Other localised swellings usually appear around the face, ears and genital area. Sometimes the face is swollen to such an extent that feeding and drinking becomes difficult. 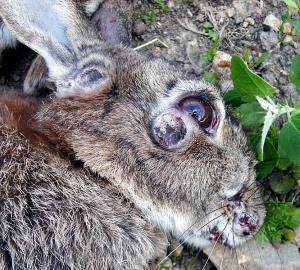 Most rabbits with Myxomatosis will be blinded by the virus and this can be the initial symptom or one of the last. Some strains of the virus produce visible lumps and lesions, known as myxomata. These usually appear on the head and face. Other painful skin irritations can occur, causing the fur to become matted together. An infected rabbit will grow more and more listless until it can no longer eat or move. Once the condition is advanced, secondary infections (i.e. pneumonia and secondary lung infections) can serve the fatal blow to infected rabbits. Currently there is no effective treatment for full-blown Myxomatosis infection. Palliative care is really the only option for afflicted rabbits and the onus is very much on the owner to provide this. The vet can prescribe pain relief and antibiotics to prevent secondary infection developing but the survival rate is still incredibly low. Because of the pain and suffering that accompanies Myxomatosis, euthanasia is usually considered the fairest option for infected rabbits. In the UK a vaccination for Myxy is available, although there is still a chance your rabbit will contract the virus even after having it. However, if your animal has been vaccinated there is a much better chance of survival and very often complete recovery is achieved. The Myxy vaccine can be given to rabbits after 5 weeks of age and then as an annual booster. Keeping an infected rabbit isolated, clean and warm stands it in the best stead of combating the illness. A rabbit must also be kept well hydrated and given regular nourishment. Before all this, a concrete diagnosis from your veterinarian needs to be made to rule out other diagnoses. Furthermore, taking care to control fleas and blood-sucking parasites on your rabbit is a sure-fire way of reducing the Myxomatosis risk to your animals. Always flea-control your rabbits regularly and use a rabbit-safe insecticidal on their housing and feeding equipment. Fly nets and screens are great for use on rabbit runs and hutches to keep out mosquitoes and other flying insects during peak times. If there is an outbreak of Myxomatosis in your local area then it has less chance of reaching your rabbits if its vector (i.e. blood feeding parasites) cannot access them.